Adopt your favourite HWF Nest & Family for the entire nesting season. Your Nest Adoption will assist with the cost of the cams, maintenance and tech support that is required all year long as well as support the mission and mandate of HWF through ongoing education and activities that promote the conservation of wildlife. 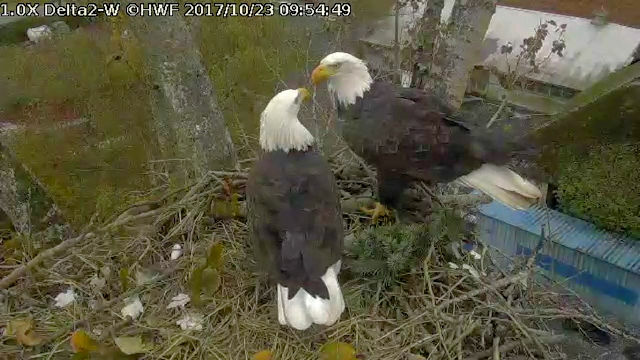 In recognition of your generous donation and gift Your Name will appear below our HWF cam page identifying that you have adopted that nest for the nesting season (September through August). You may also Adopt a Nest In Memory Of a Loved One or you may prefer to Adopt a Nest anonymously – the choice is yours. When you contact us to Adopt a Nest make sure you identify the HWF Nest & Eagle Family that you are adopting for the year. If you use PayPal or CanadaHelps for your donation, please use the comment field to say which nest you’d like to adopt and how you’d like your name listed. Tell your family and friends about this new donation program; Adopt a Nest makes a wonderful gift for your loved one. HWF would like to thank you for your generous gift; Together we make a difference!